Matthew Bates in action for Hartlepool United. 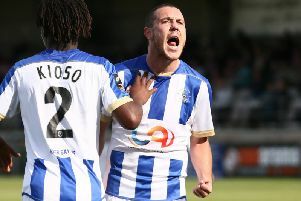 Hartlepool United’s Matthew Bates is on the verge of a first-team return. And the Mail understands that the former England youth international could be about to ease Craig Hignett’s defensive woes by declaring himself fit for the League Two trip to Barnet this weekend. Bates has been out of action since August 27, when he was taken off towards the end of the 2-2 home draw with Newport County with a foot problem. Pain from that issue, which was eventually diagnosed as bone bruising, has prevented ex-Middlesbrough man Bates from training to a large extent, despite the defender feeling fit to return. But, having had to be patient, last week Bates began running again at the club’s Maiden Castle training base. And despite Saturday’s 3-1 home defeat to Leyton Orient coming around too soon, Bates has stepped up his regime over the weekend and could be in line for a place in Pools’ starting XI this weekend. His return would come as a timely boost for Hignett and his under-fire back four, after a defensive calamity allowed Orient to come from a goal down to win at the Northern Gas & Power Stadium at the weekend. Bates is not the only defender nearing a return, though. It’s understood that Rob Jones is also not too far away from action. The big central defender is said to be a few days behind Bates in terms of progress, but has not been ruled out of making the bus South this weekend. On any potential return for the duo, Hignett said: “Both of them are massive players for us. We miss them. “They are talkers who have leadership qualities. They would have made a difference at the weekend. “They are the type of players who have the know-how to be in the right positions and communicate with others around them also. While Hignett is keen to get the duo back, he won’t be tempted to take risks with either, especially given that they have been out long term. The gaffer said: “I don’t want to throw them in if they are not right. “The worst thing we could do is throw them in and they break down and we miss them for the next six or seven weeks.